This week, we finish the book of Genesis. Again, while the surface looks fairly rosy, what lies beneath is much darker. At the start of the portion, 17 years have passed, so Jacob is now 147, and the famine has been over for 12 years. Jacob methodically prepares to die. Joseph promises to bury him in the Cave of Machpelah in Canaan. Jacob formally adopts Joseph’s sons, Ephraim and Manasseh, as his own, increasing Rachel’s status by expanding the number of tribes of which she is matriarch, from 2 to 3. He also deliberately blesses the younger son, Ephraim, over the elder, seeing clearly which will dominate in the future. Then, he speaks a last word to each of his sons, a mixture of prophesy and performance review. Jacob’s ratings, from highest to lowest, appear to be roughly as follows: Judah and Joseph; Asher and Naphtali; Zebulon, Dan, and Gad; Issachar and Benjamin; and, lowest in Jacob’s estimation, Reuben, Levi, and Shimon. Reuben’s wishy-washy lack of character has been demonstrated several times, and Levi and Shimon are chastised for their cruel massacre of the men of Shechem. Eventually, the tribe of Shimon pretty much disappears. But Levi is the progenitor of Moses and Aaron. Go figure. Joseph is Jacob’s favorite, but Judah’s is singled out for kingship. Why? Had Joseph become too Egyptian? As I’ve noted before, Prof. G. A. Rendsburg of Rutgers (in the Teaching Company’s audio course on Genesis as literature) places the writing of the book of Genesis in the 10th century BCE, the height of the Israel’s power as a kingdom under a descendant of Judah, whence the need to provide some literary connections supporting the appropriateness of Judah, a fourth son, as the political leader. Jacob is buried in Canaan, which required he be embalmed. The children and livestock were left in Egypt until (or ensuring?) the brothers’ return. Then the 10 older brothers lie to Joseph, saying Jacob had wanted Joseph to forgive them for what they’d done. Joseph weeps, realizing that they will never trust him and will always be consumed by guilt and fear. At 110, Joseph dies and is embalmed; by the way, 110 years was seen as the ideal life span for an Egyptian, the way we use “may you live to 120!” today. He has asked that his remains be taken back to Canaan, but only at the right time, when the Lord will take the descendants of Jacob out of Egypt. Talk about foreshadowing. DESERVES PROMOTION: Create new title to make him/her feel appreciated. 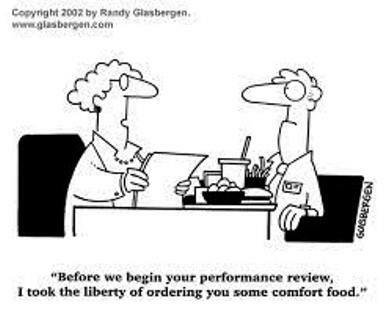 Get Rid of the Performance Review! It destroys morale, kills teamwork and hurts the bottom line. And that’s just for starters. An alternative strategy is to select the perfect final words now, say them and then remain silent until it’s your turn to join the heavenly chorus. George Carlin had a funny bit where he advised his audience that there is a “mysterious and little-known stage of dying called the two-minute warning. Most people are not aware of it, but it does exist. Just as in football, two minutes before you die you receive an audible warning: ‘Two minutes! Get your act together!’” (Carlin replaced “act” with a four-letter word more to his liking.) The reason most people don’t know about the two-minute warning is because the only ones who hear it are dead two minutes later. Carlin suggested we use these last two minutes “to entertain and go out big.” I second that motion. Many famous people have accomplished that by giving their last words, or close to last words, a comic twist. One last idea. The end can come quickly and unexpectedly. To counter this, some people have their last words tattooed on their chest in case they go by accident. I’m just sayin’. This Week’s Ponder: What happens if you get scared half to death twice? This entry was posted in Uncategorized and tagged Egypt, embalming, Ephraim and Manasseh, Genesis, Jacob, Joseph, last words, performance review, Rachel. Bookmark the permalink.